Will this be my final destination–Casablanca? Will this be the city where I bury my broken heart–Casablanca? The trip I made to Tokyo reunited me with my two great loves: Miyazaki and Studio Ghibli, as I’ve written about before, and the Takarazuka Theatre Company 宝塚歌劇団. This time, I went to see the Takarazuka Cosmos-Troupe’s musical version of Casablanca. See an official video from Takarazuka here. 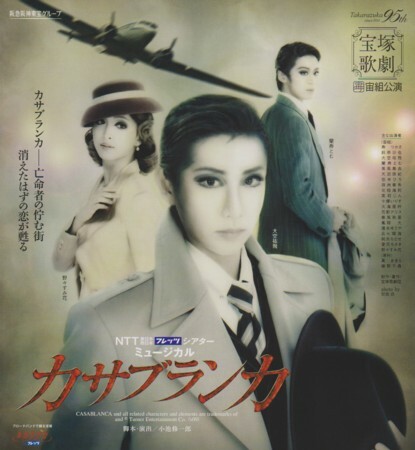 First, for those of you who have followed this blog and what I’ve written about Otomen, Berusaiyu no Bara, and Haken no Oscar, it should come as no surprise that I am a fan of Takarazuka, an all-women musical theatre in which the actors play both the male roles (男役otokoyaku) and female roles (娘役musumeyaku). I saw my first Takarazuka musical when I was studying abroad in Osaka, and I’ve been hooked ever since. When I went back to Japan, I was dying to see a show, but since it’s hard to escape my region to get down to the theatre near Kyoto or in Tokyo, I hadn’t made it. However, the beginning of the run of Casablanca in Tokyo happened to coincide with a time I could be there, so I seized the opportunity and went to go see it with a fellow ‘Zuka fan-friend. I had never even seen the film Casablanca until the week of the performance, and, while I really liked both versions, I liked them for different reasons. In the film, Humphrey Bogart portrays Rick Blaine as an extremely bitter man, and even when he helps people, he covers up his true feelings–we’re never quite sure of his motivations. Also, even when we do finally get flashbacks to his pre-Casablanca existence, Rick’s pre-Isla background is still somewhat mysterious. Ozora Yuuhi’s Rick, on the other hand, is a much more romantic man than Bogart’s, but this impression comes largely from the Takarazuka version’s focus on Rick’s backstory. In the flashback scenes, we see him aiding the anti-Fascist forces in Spain and meeting Isla for the first time, two scenes that are only vaguely described in the film. Because of this, the Takarazuka Rick of the time before Rick’s Café Américain seems surprisingly tender and romantic compared to his current bitter disposition. Furthermore, a lot of the flashbacks explain why Isla left him, whereas in the movie, we’re as confused as he is. That is, the musical’s audience knows more than Rick does, whereas in the movie, we have only the information that Rick has or is told. Isla confronts Rick after the cafe closes. My one beef with the Takarazuka version was the “Kiss me like it’s the last time” scene. In the film, Bogart kisses Bergman like it’s the last day on earth. The problem with Takarazuka’s version is the kissing–because they fake it. * Now, I’ve seen some pretty sexually charged scenes in Takarazuka before, but the actors are made to fake kissing—usually achieved by rotating their heads in such a way as to mimic a kiss without touching lips. And so when Isla asks Rick to kiss her like it’s the last time, I remained unconvinced. This, for the record, is how you do a kissing scene in Takarazuka the RIGHT way (from about the 2:00 mark). 落陽のパレルモPalermo Shines in the Setting Sun, 2005, starring Haruno Sumire. Lazlo leading "La Marseillaise" over the Third Reich anthem. From the Asahi Shinbun official stage photo site. Second, though the musical wasn’t exactly like the film, I thought it captured the essence of Casablanca and the romanticism of war-time Europe embodied in the film. Takarazuka didn’t really change a lot of the story, but, as I’ve said, did add some scenes to flesh out the backstory. A lot of the lines were exactly the same, right down to Lazlo ordering two Cointreaus on his first trip into the café. The songs, particularly the chorus numbers, didn’t feel forced or unnatural. The song that the chorus of European refugees sang outside of the French embassy was particularly moving. The set was also brilliant—a revolving set that usually revolved between Rick’s Café Américain and the casino or the market, it provided a lot of great opportunities for characters to dash in between the “sets.” For example, when the Nazis barrel into the connecting door to the Café from “outside” to arrest Lazlo, or when the sets were rotated between the Bulgarians at the casino and the Nazis singing the national anthem, the effect was definitely an increase in dramatic tension. My favorite scene in the musical was, by far, the “last train to Marseilles” scene. There was a far greater sense of urgency in the musical than in the film. The chorus all boards the train as Rick reads the letter from Isla. Just as Sam drags him on to the train, the chorus runs out from the eaves again as a rush of late-comers trying to board the full train while the conductor tries to keep them off the platform. The sheer desperation of those who couldn’t board was palpable. On the other hand, my favorite scene in the film was the scene in which Lazlo interrupts the Nazis in the café by leading the refugees in “La Marseillaise.” I was actually moved to tears by this scene, and I think this scene really reflects why the play worked so well as a Takarazuka musical. A large component of the Takarazuka romantic dream is about the romanticism of Europe. Lazlo’s grand romantic gesture of resistance—leading the patrons in a song that was banned in Vichy France and whose lyrics are about rising up against a tyrannous enemy—is just the kind of blend of “European” and romantic that the theatre favors. This is usually referred to as ユーロッパの憧れ –longing for Europe. Although this phrase usually refers to a “Europe that never was,” for the patrons of the Café Américain, it is a longing for the Europe that cannot be. “We’ll always have Paris,” too, is part of this longing. For Rick and Isla, it’s a longing for a Paris–and a love–that used to be. As for us theatre-goers, it’s a longing to participate in the imagined dreamworld of Europe. In Japan and, to some extent, in the US, Europe carries the image of being exotic and romantic, both in the sense of sophisticated foreignness and in the sense of the idealized contemporary “Western-style” ideas of romantic, passionate love. ** In contrast, Casablanca is a purgatory in which those longing for the dream of Europe have temporarily escaped. In this state, the cast’s romanticization of Europe is very much in line with the audience’s. To Rick and Isla, Paris symbolizes living the (seemingly) carefree life of an expat, falling in love–and if the audience identifies (or wants to identify) with the characters, we graft our desires to experience adventure and romance onto this object of Paris as well. Takarazuka has a number of really interesting shows coming up, such as the second run of The Scarlet Pimpernel, and I’m going to try my best to see more of them while I’m still in Japan. When you live in a very cold apartment in a very rainy rural town, it’s nice to escape to the city and enter the fantasy world (and centrally heated facilities) of Takarazuka for a few hours. *I believe this tradition persists for two reasons. The theatre was founded as a women-only theatre to protect the “pure” image of the actresses (and as a novelty), and secondly, kissing in public—even on TV—in Japan is still a bit taboo. Kissing is considered something for the bedroom, not as an acceptable public behavior for adults. Most Takarazuka plays do have kissing, because most of the characters are European or American, and that’s how we show affection—and because it fits it to romantic sensibilities of the theatre, whose model of romance is rather Western. I was searching around on Blogsearch for other Takarazuka fans and found your great site. (I’ve now subscribed via RSS) — I saw my last show in Spring 2008 on a trip back to Japan and am already itching to see another sometime in the future. I first saw the theatre while studying at the Stanford Center in Kyoto, then lived in Osaka. Were you at Kansai Gaidai? hope you enjoy them and keep up the great blog!